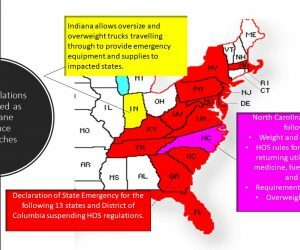 Due to the winter storm that is anticipated to affect 22 states this week the Federal Motor Carrier Safety Administration has extended the regional emergency warning. Commercial truck drivers who are hauling heating fuels including: natural gas, heating oil, propane, gasoline and other fuel goods traveling to these eastern states are excused from the Hours of Service Regulations until February 2nd, or when the weather emergency has been lifted. Along with the FMCSA stating a regional emergency, Alabama Gov. Kay Ivey issued an emergency regarding the winter storm to motivate the HOS suspension for the state and any truckers providing relief to these areas. Indiana Toll Road placed a travel ban from noon Monday January 28th until noon Tuesday January 29th. This banned any long-doubles (high-profile), tractor-trailers, high-profile oversize permit loads to travel the toll roads. Ohio Valley into the Northeast is expected to have snowfall Monday into Tuesday this week. The snow will continue to travel south to Alabama, Mississippi and Georgia. The travel situations are anticipated to become worse as the week goes on. Not only is the snow a weather concern, but the extreme frigid temperatures, wind chills, possible frostbite and hypothermia concern many people. By the middle of this week, the Midwest including Des Moines, Chicago, Milwaukee, and Minneapolis may see negative temperatures. However, Ohio Valley and the Northeast can see sub-zero degrees. 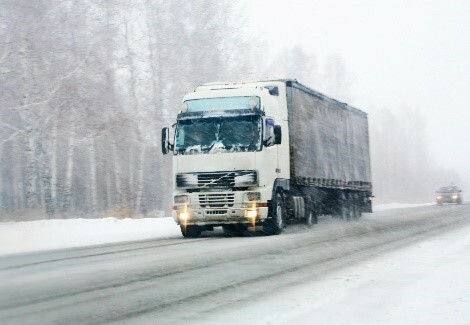 With the arctic blast quickly approaching, many truck drivers worry about traveling in the winter road conditions. 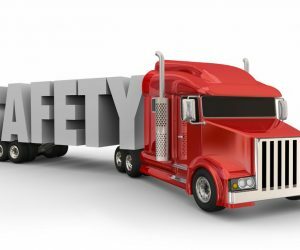 Some may even ask “can I choose not to drive in dangerous conditions?” In fact, according to the employee protection provision of the Surface Transportation Assistance Act, drivers can rightfully turn down a load or refuse to operate their truck if road conditions become unsafe for them to travel on. The United States Department of Transportation guidelines state “if conditions become sufficiently dangerous, the operation of the commercial motor vehicle shall be discontinued and shall not be resumed” that is until the road conditions become safe again. Therefore, just because snow is being predicted, or they believe the road conditions may become dangerous drivers cannot turn down a load. Instead, the road conditions must meet a requirement that deems them unsafe to travel at the beginning of the haul or during the route. If truck drivers notice the roads have become too dangerous to travel, they must notify their dispatchers on their refusal and give reasoning. It is advised to give this notice in writing so there is a record to be followed up with if needed. Communicating with dispatchers via CB radios, text or e-mail, and give a full explanation on why you believe the road conditions are unsafe and the reason you refuse to operate your commercial vehicle. 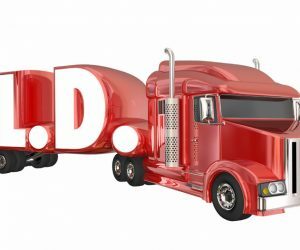 If you believe that you may be fired for refusing to operate your commercial vehicle, it is advised to keep any documentation backing your decision. In this case, collecting all weather forecasts from the news stations or from the National Weather Service are good documentation to keep for possible future arguments. Also, if possible, obtain photographs of your communication on the refusal along with names, phone numbers and others who have encountered the same driving conditions. In the case you have been fired for your refusal, a claim with the Surface Transportation Assistance Act (STAA) has a statue of limitations. Once you have been terminated, you have 180 days to file a claim with the Occupational Safety and Health Administration (OSHA). You may also contact an attorney regarding your claim to see if you will have any luck pursuing your claim, and the best possible way to proceed with your claim.